Now a new, open-access article in the Journal of Integrated Pest Management (JIPM) provides a comprehensive overview of the ALB, including a review of its biology, life stages, distribution, ecology, and methods of detecting and controlling it. The supplementary tables in the JIPM article will be particularly helpful for managers, according to the authors. The first lists nearly 160 different trees on which the ALB can feed, oviposit, or complete development under field conditions. Another lists tree species that are not considered to be ALB hosts, so they may be good choices for replanting efforts. Because the ALB is often first noticed by the public, the authors stress the importance of finding them sooner than later. 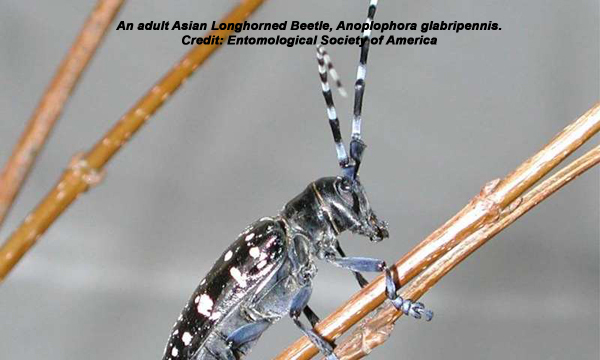 The authors hope that forest managers and others will put this insect profile to use.